Delivers volumes of moving air. Motor is dependable 3-speed, 1/4HP, 1 phase, 115V ball bearing totally enclosed permanently lubricated permanent split capacitor. Pull chain switch. Durable blade features steel hub and spider with aluminum paddles. 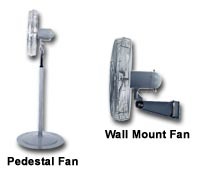 Fan head tilts 15Â° up and down for convenient adjustability. Column height adjusts 4-1/2' to 7'. Pedestal base is 26" dia. Meets OSHA standards. UL listed. FOB Shipping Point. Product No. Fan Dia. Fan Type CFM High CFM Low AMPS High Wt. (lbs.) Price Ea.